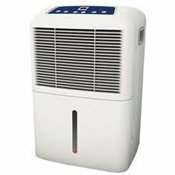 The Sunpentown 65 Pint Dehumidifier (SD-65E) is a high capacity room unit rated by the manufacturer for areas of up to 500 sq ft. It is Energy Star rated for efficient extraction of water at a rate of 65 pints every 24 hours. Capable of operation in low temperatures it is effective in cool locations and would be suitable for a finished basement or any other room in the house. Less well known than some of the foremost brands the Sunpentown Dehumidifier is earning a reputation for sound performance with many users. The ability to perform efficiently at low temperatures is essential in this class of room dehumidifier with many purchasers buying 50 to 70 pint models for use in their part finished or finished basements. Because warm air rises and is replaced by cooler air a basement is frequently the coolest part of the home. It should be stressed, however that this is not purpose-designed for basements and it would not be suitable for a basement that was unheated, except in warmer regions, or for a basement with significant problems with water seepage from outside. The Sunpentown 65 Pint Dehumidifier incorporates an adjustable humidistat with which your preferred level of relative humidity can be pre-set. Any level, in 5% increments, may be set between 35% and 80% relative humidity. Many people will choose either 45% or 50% as at these levels the air is comfortable to breathe and feels relatively cooler. Mold, condensation and moisture damage are also prevented at these settings and a level of 50% or lower will control dust mites, a major source of allergic reactions in those who suffer from them. Levels of relative humidity significantly below 45% can become uncomfortable for some and may lead to excessive drying out of some materials such as wood and leather. The benefit of the humidistat is that it maintains a level of relative humidity that is "just right" for both you and your possessions. It also ensures economical operation of the unit as it only cycles on if your pre-set level is exceeded and cycles off again once it has fallen back to your preferred percentage. The Sunpentown 65 Pint Dehumidifier also offers two options for dealing with the water collected from the air. It has a water collection container capable of holding 21 pints of water which can be easily removed and emptied with the help of a convenient handle. This will probably be necessary about once, maybe twice a day and if that is inconvenient or annoying the second option is continuous drainage. The Sunpentown 65 Pint Dehumidifier is designed to allow a small hose to be attached to an outlet in the casing and run to a nearby drain. The water will then pass out of the machine to be discharged into the drain as it is removed from the air, relieving you of the task of emptying the bucket. The water is drained by gravity so it may be necessary to raise the unit a foot or two from the floor, depending on the location of the drain. Condensate pumps can be separately bought which will force the water to a higher level if needed. The Sunpentown 65 Pint Dehumidifier is also portable and is equipped with caster wheels for easy movement across the floor and a retractable carrying handle for occasions when it needs to be lifted into position. It is not a light-weight machine because of its high capacity but is comparable to other models in its class. It also includes auto-restart to reactivate the machine following a power outage, a washable air filter, electronic controls for ease of use and two fan speeds so that if faster drying is needed the higher setting may be selected.